Jeans. It's actually kind of controversial in the long-haul travelers circle to bring and wear jeans. The detractors say they are too heavy, don't dry fast enough and are impractical for hot weather countries (of which most of our trip would take place). Ok, fine, technically they have a point. But I am a jeans and t-shirt guy. I feel more comfortable in a pair of Levis then I do in anything else. I only brought one pair of new, dark blue Levis and 7 months later I am wearing the same pair, only now they're a lot lighter, thinner, and worn in. I'll also add that jeans are universal. You will fit in pretty much anywhere in the world in a pair of jeans, unlike those quick-drying, sweat-wicking, anti-microbial, quick-zip-off safari/trek/travel pants' that so many travelers wear. SteriPen. I don't think I would be comfortable drinking the tap water in any of the 13 countries we visited. So, what does everyone do? Buy bottled water. Sometimes we did too. But think about all the millions of plastic bottles every year that end up on landfills and roadsides because of tourists. So when we could, we used our Steripen. It's essentially a UV light saber that you wave around for a minute in a bottle of questionable water, and voila: drinkable water, free of parasites, bacteria and viruses. Admittedly, the water doesn't always taste great but that is more a product of trace amounts of things like metals, which over the short term are not harmful. SteriPod. Not related to the Steripen other than it's shared purpose to help prevent the ingestion of unwanted microscopic baddies. The Steripod is a simple idea well-executed. A built-in antibacterial disk keeps your toothbrush from growing nastiness on your travels. Kindle. Just before we left we bought the cheapest of the Kindles. I love books. I'm especially a fan of paperbacks that, when I am done reading, look more like something that's been read 50 times rather than once. But, when every ounce of weight you add to your bag is another ounce you lug around on your back for hours at a time, packing even a few books becomes excessive. The Kindle is great for this. We loaded at least 60 books on the Kindle before leaving and have added several more along the way. It hasn't stopped me from occasionally buying an obscure 1970's sci-fi paperback in a used bookstore here and there but that's more out of an addiction. Pedometer. We quickly tried to calculate how many miles we've walked and came up with an estimate in the 800 to 1200 mile range. But it's would have been awesome to have a small pedometer to know a more exact number. Asians hate the sun. You know how white people like to lay out and get tan? Asians think that is CRAZY. Most Asian cultures think of lighter skin as healthier and more attractive. So much so that young people will go out during the day with as much clothing needed to cover exposed skin. In nearly 100 degree weather, Teenage girls will be wearing a hoodie with the hood up and a face mask covering their face. Sometimes their jackets have special hand covers for scooter driving. In pharmacies there are even sections devoted to whitening products. Are there any Germans left in Germany? At this point we've met as many German travelers as we've met Indians in India. Sure, there are lots of French, Aussies, and Brits traveling as well. But, by far, Germans have been the majority. 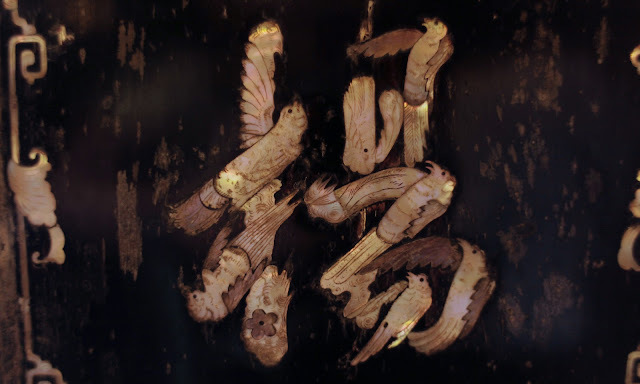 And they were everywhere. We'd walk up a secluded trail to some summit and there'd be a couple Germans there. As some guidebook we read said "Germans love a good walk". I guess the explorer spirit is still alive in the German people. Plus, it helps that the typical vacation time of a German worker is 6 weeks a year. Our fancy hotel room. It was the size of our apartment. Our hotel lit up at night. The rooftop bar at Rex Hotel. The view was fine but the drinks were way overpriced. 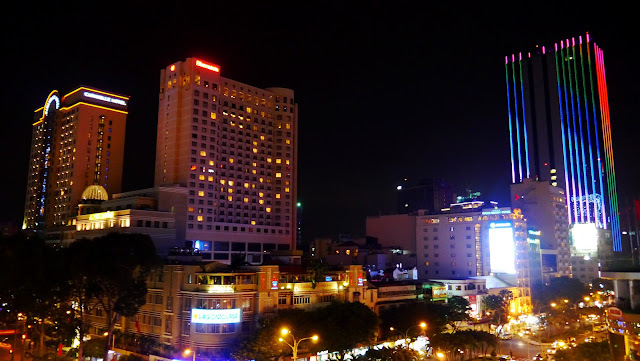 A portion of Saigon's skyline. Even in a metropolis of 9 million, there is still room for a few roosters. 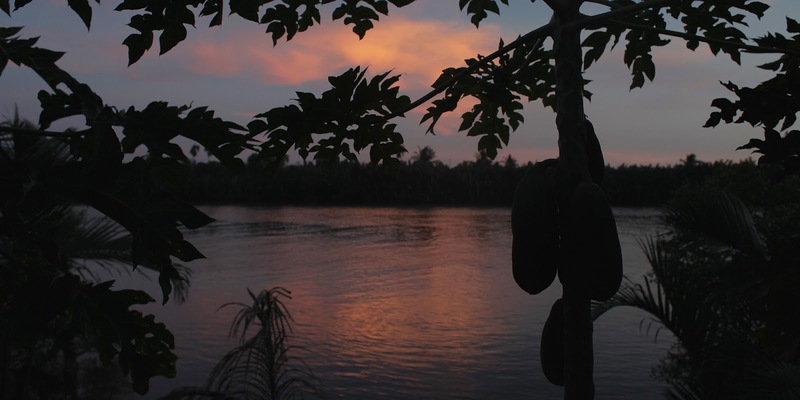 We returned to Saigon from the Mekong Delta, knowing we only had one night, and two full days in town. We realized we would not be getting a real feel for the city, but had gotten pretty good at this quick, drive-by style of travelling. We decided not to stay in the backpackers ghetto for once, and instead splurged on the hotel Graham Greene made famous, the Hotel Continental. 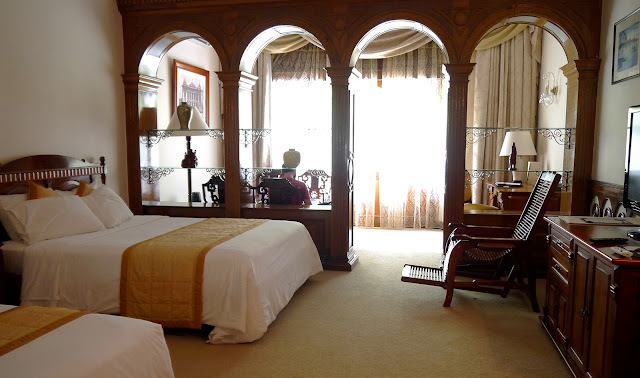 The palatial room was well worth it (especially since it was less than $100 on sale), and we were reminded of just how lovely a soft bed, nice pillows and high thread count can be. We wandered around town, making a half hearted effort at souvenir shopping. Having to carry our possessions on our back for 7 months had put a damper on any desire to acquire new things. It's hard to break out of that habit. We did eat at an excellent dinner at Cuc Gach Quan, had noodles in the market and Bahn Mi on the street, and drank over priced cocktails on a rooftop followed by cheap beers in our room. All in all it was a fitting end to our adventures. Coming home we flew via Bangkok, and then Korea. We had been watching the news so we felt safe enough to plan a day trip into Seoul for our 10 hour layover. Unfortunately we had totally underestimated the weather and found ourselves in 55 degree rain with no jackets or sweaters. Since it was early morning after a long flight we also didn't think through our transit desk vs immigration choice. So, we ended up on the outside, in the boring 'public' part of the airport, waiting 7 hours to check back through to the inner sanctum (clearly the part of the airport that won them the Best Airport title). Being back in Vancouver visiting family and our new niece is both comforting and a little disorienting. We definitely have a lot to process about our trip (that's a future post), but also a lot to plan for the next one! Approaching YVR over the city. 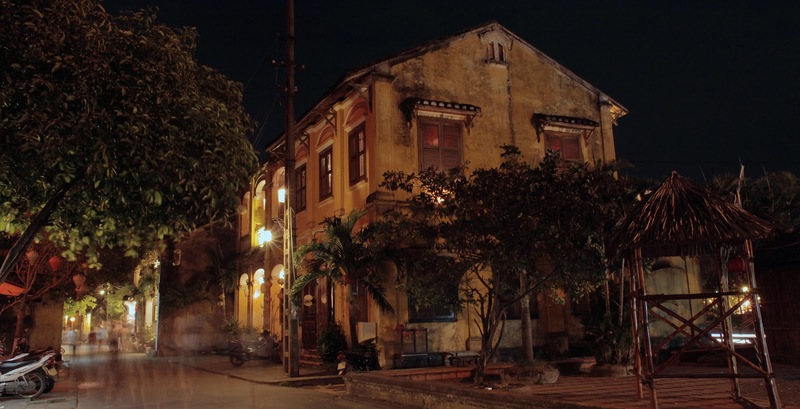 A typical street in Hoi An's ancient town. A 'cafe' we stopped at to have an iced coffee. 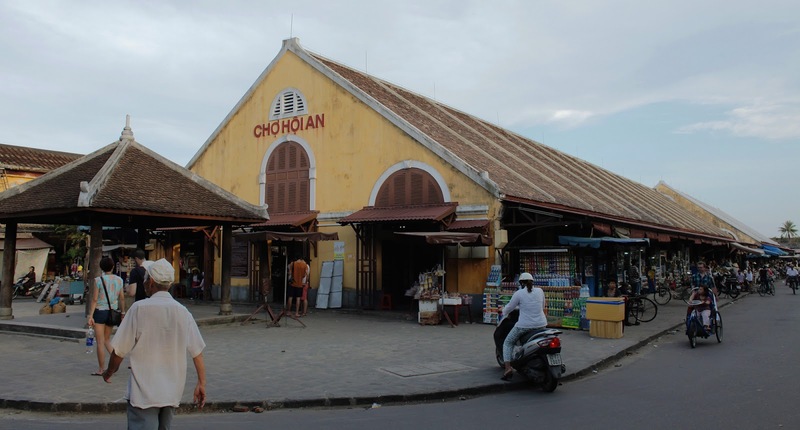 The covered market in Hoi An. 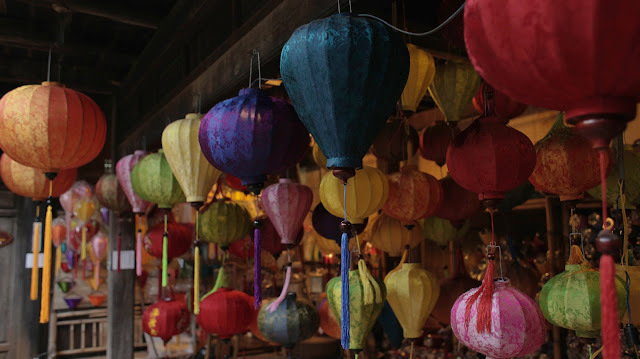 Lanterns hang in a shop. One of the Chinese communal houses. Chinese script made up of strokes of birds. Dusk on the Thu Bon river. An old house (now a restaurant) in old town. Matt getting fitted for a suit. Hoi An is almost too pretty. By that I mean, it almost feels like a section in Epcot Center. 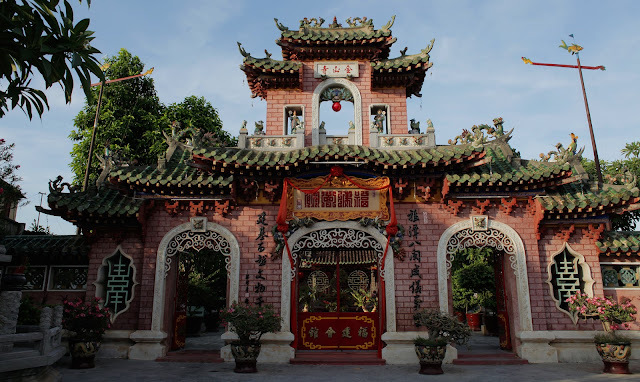 Flowering plants dangle from balconies, red and other colorful lanterns adorn every entrance, and all the old buildings feature terracotta roof tiles and a yellow ochre paint job. 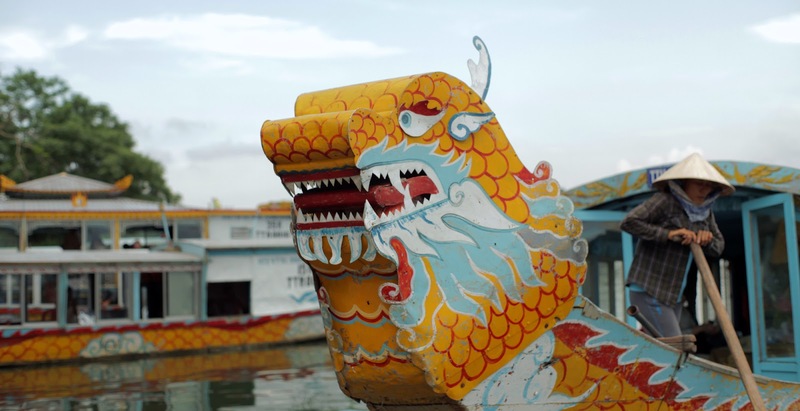 The ancient town of Hoi An has been designated as a UNESCO World Heritage Site in 1999. During most of the day, cars and scooters are prohibited, which adds to the slow pace of life here. At one time Hoi An was a major center for trade through Asia. The traders from China, Japan, India and the Netherlands influenced the culture and architecture. And many small groups of Chinese settled here after being oppressed at home. But then the river silted up making it undesirable as a trading port. 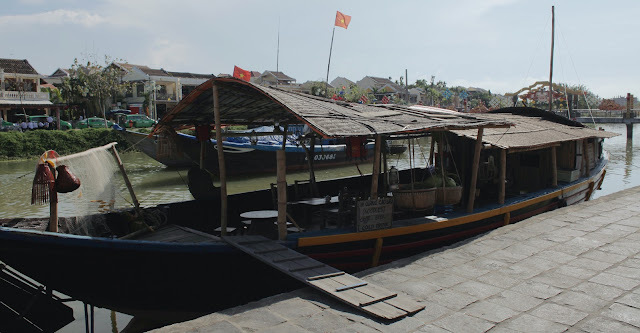 So for the next 200 or so years, Hoi An didn't really change much. Until the tourists started coming. Now, most buildings in the old town feature shops, and most of those shops are custom-tailored clothing shops. The tailoring biz has really taken off in Hoi An and now it seems that most locals are involved in it some way or another. Interspersed between the tailor shops and other souvenir shops are heritage buildings that have been restored to a time when the building's use was at it's height. We went around town, trying to be good tourists and see all the heritage houses. It was fun, but most buildings are small and when a stampede of a Chinese tour group comes in, all you can think is 'where is the nearest exit'. Let me just note here: I like Chinese people. When we were in China, we met a lot of really nice people and didn't have one bad experience (aside from the spitting). But a "Chinese Tour Group" is another thing all together. I don't dislike them, but I don't want to be crammed in a small, albiet beautiful, museum room as the tour guide waves his little flag in my face. We did give in and decided to get some tailor-made clothing. I got a suit and a pair of jeans, Bree got a dress, a shirt, and 2 pairs of shoes. All of these items completely made from scratch in about 24 hours. And at lower prices than anywhere in New York. Inside the train from Hué to Danang. 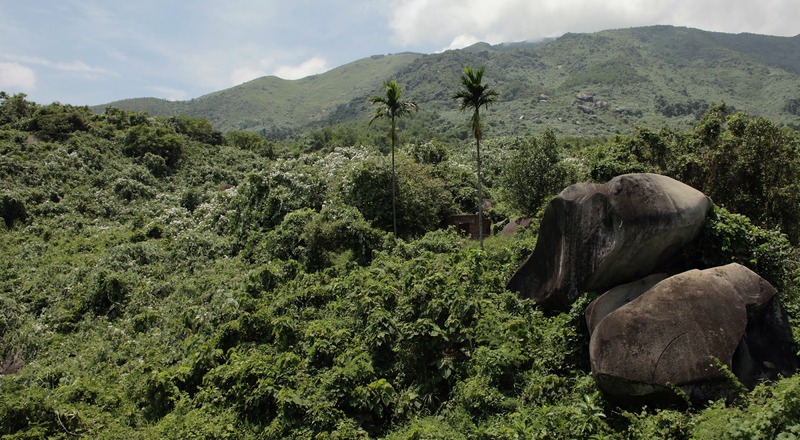 The train traveled though some of the more beautiful landscape we've seen in Vietnam. The rocky coast into the South China Sea. 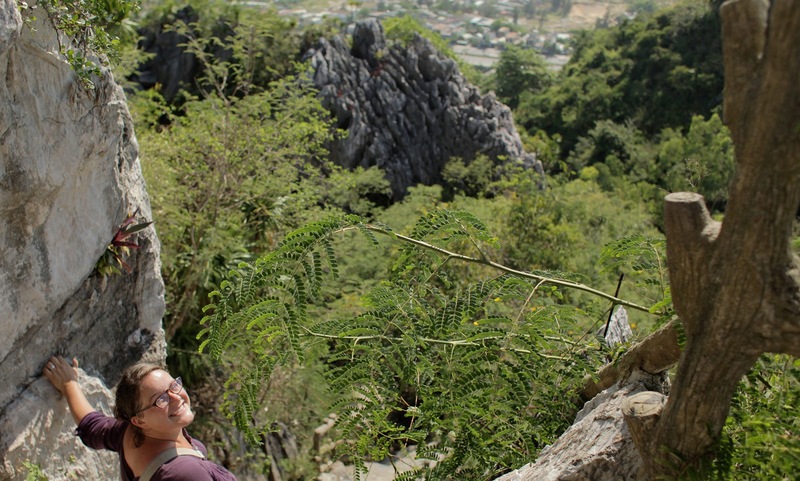 The elevator up to the Marble Mountains. A pagoda built on top of one of the mountains. Many of the caves in the Marble Mountains are Buddhist shrines. The view from the highest peak of the Marble Mountains, China Beach stretches down from the right. As opposed to the last train we took, this one rocked. It was only about 3 hours long but passed through some of the prettiest scenery. I maybe sat in my chair a total of 15 minutes. The rest of the time I spend in an empty train car that had open windows on both sides. I took some video (which I will try and post at some point), and took photos the whole time. There were tunnels, train bridges, mountains, secluded beaches, waterfalls, overgrown military outposts, and small hillside villages. 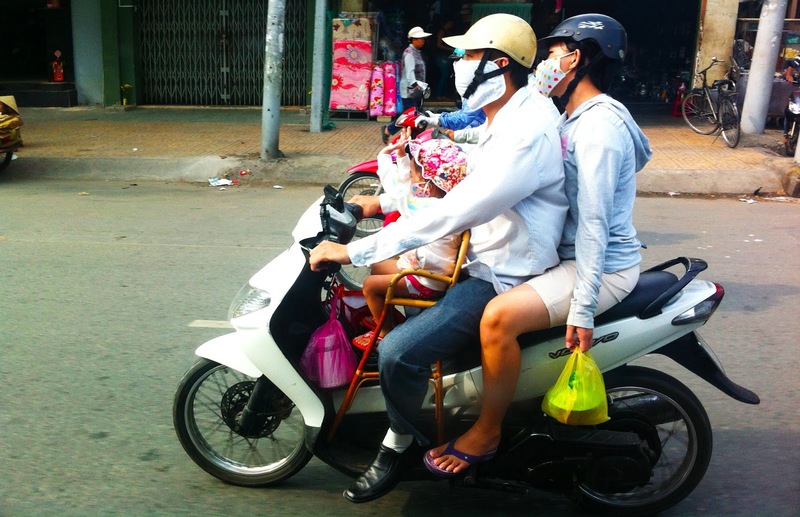 This stretch of Vietnam's coast really packs it in. After the train we got a taxi to take us from Danang to Hoi An with a stop at the Marble Mountains. Which, as you can probably guess are several rocky outcroppings made of marble. We trekked up to the top to see the view, peaking in some of the naturally formed caves along the way. It was really hot and by the top we were both pretty drenched in sweat. We happily jumped back into the air-conditioned taxi for the remained of the trip down to Hoi An. Our train from Ninh Binh to Hué. Matt deciding what to do. Inner walls and moat of the citadel. Much of the citadel was destroyed during the Tet offensive in 1968. Some buildings remain and some are being restored. Some sort of shelter within the citadel. Thien Mu Pagoda, the tallest in Vietnam. 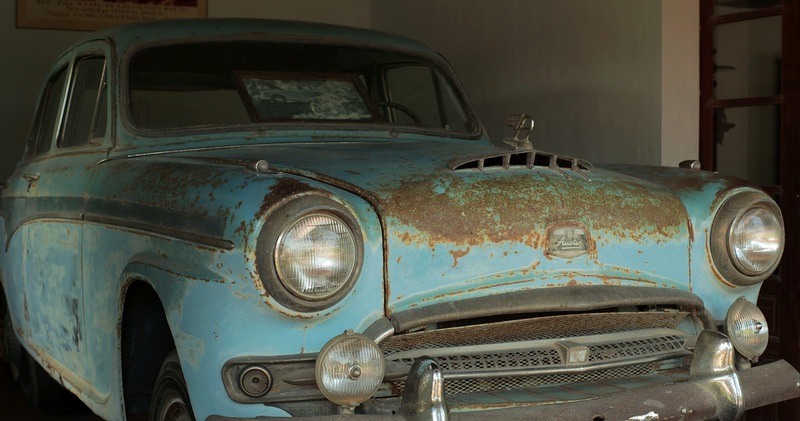 The car that the Buddhist monk, Thich Quang Duc was riding in Saigon before setting himself on fire. As seen in this pulitzer-prize winning photo. And the cover of Rage Against The Machine's album. 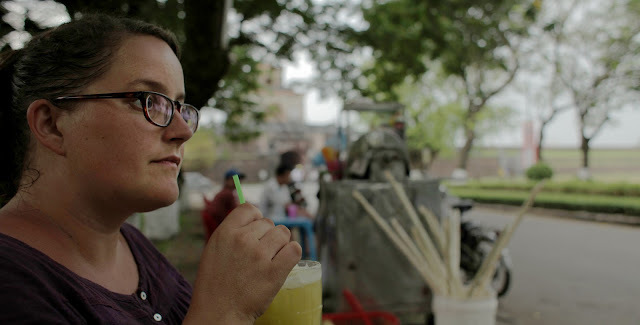 Bree sips sugarcane juice on the side of the road. Children actually reading in the bookstore. If you know Matt, you know how excited he was when he saw this. Assorted vegetarian versions of Vietnamese dishes for lunch. We boarded the train in Ninh Binh, bound for Hué. 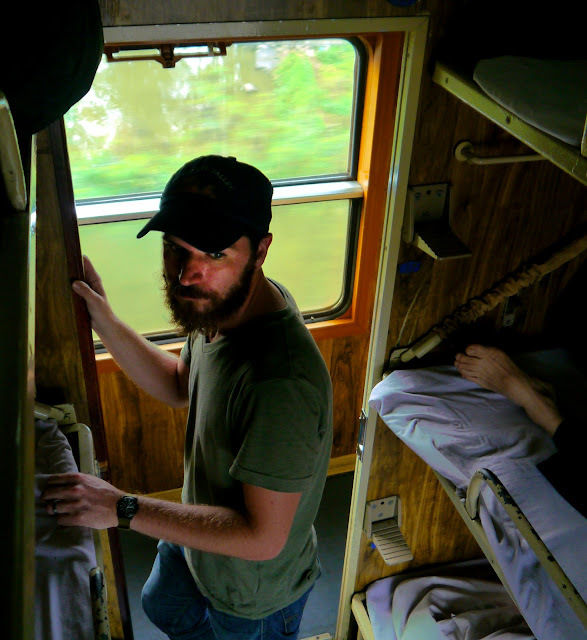 Soft sleeper was unavailable so we went with hard sleeper, which is six berths per compartment as opposed to four. It would have been fine but the guy who had the bottom bunk (where people are supposed to sit during the day) decided he wanted to lay down for most of the journey. So that meant that our only option was to lay down in our upper bunks. So the trip was mostly uncomfortable, but we've done worse. By around 6pm we arrived in Hué (pronounced hway). 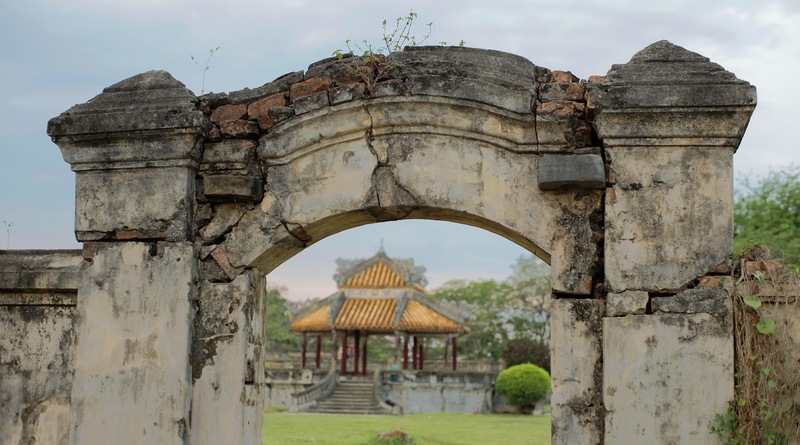 Hué was the capitol city of the Nguyen dynasty until the end of WWII. 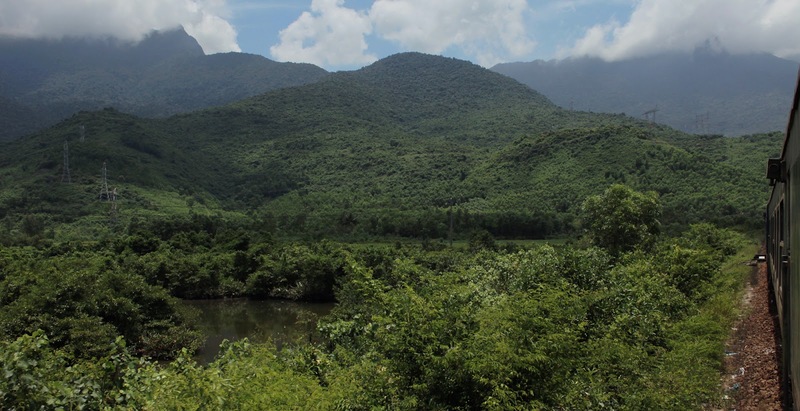 It was also the site of one of the bloodiest battles of the Vietnam War, which eventually left about 80% of the city destroyed. If you've ever seen Full Metal Jacket, the battle of Hué is where most of the fighting in that film takes place. With the exception of the crumbled remains of most of the buildings within the citadel walls, you don't really get any sense if that turbulent history now. Hué is a major tourist stop but we never really felt overrun with tourists. And even the more touristy restaurants and bars have a good deal of locals mixing the crowd up. We really liked Hué. 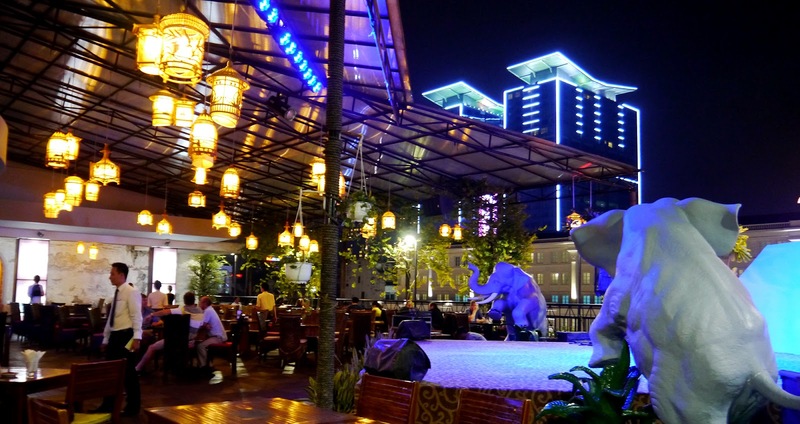 It was easily walkable, had a laid-back vibe, and had really good food. 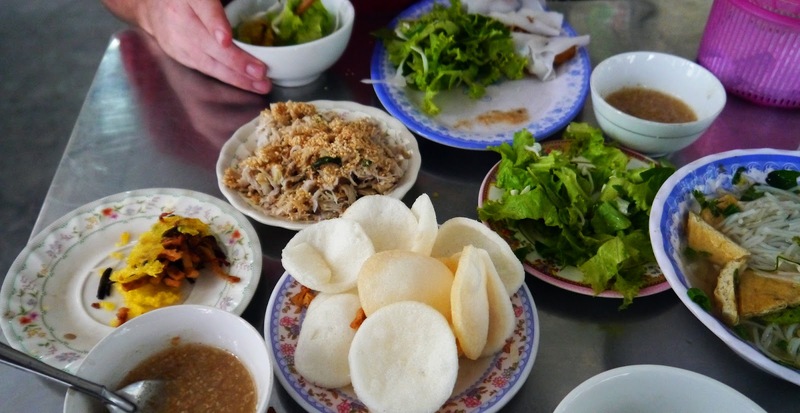 The culinary history in Hué included several lords that were very picky eaters. And because of the strong Buddhist contingent, there are a lot of restaurants that are vegetarian or have vegetarian options. 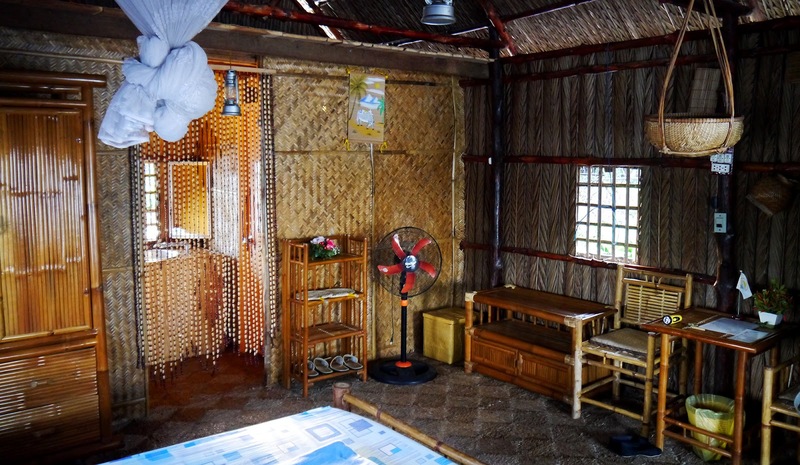 As we left, I mentally put Hué on the list of places I'd like to spend more time in.